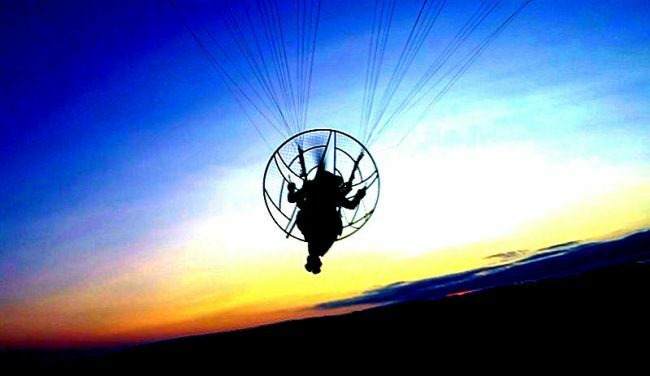 What is paramotoring like and is it really something you’ll enjoy doing? I hear the same question, time and time again: "How can we stop all of these paramotoring accidents?" It's an important question, every year the death toll increases, and so does the number of non fatal accidents. In the six years that I've been flying, I've met a massive number of pilots who tell me their training didn't even cover the most basic safety advice. And this is where the problem lies! 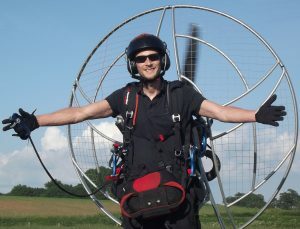 Paramotor training is important, but unfortunately courses are incredibly short. Time is of the essence, so 95% of training is spent in the field ground handling, and with a few short flights. New pilots are coming away from training with less than 5 hours flight time, and very little knowledge of so many important aspects of the sport. Well, better schools with more thorough courses would be great, but that would come at a great cost; and we know most eager beginners will usually go for the cheapest course! The second option is an online resource like this website, which is great, and my posts have helped thousands of pilots. But all posts are based on keywords that new and existing pilots are searching for on google. I could sit and write articles on every part of the sport, but without people searching for those keywords, the posts simply wouldn't be seen. And that's where the eBook comes in. Now everything is contained on a single file that you can download, and return to whenever you need help or advice, instead of using trial and error like most pilots do. I spent many months writing about everything that's important for beginners, and even existing pilots. And the result is 149 information packed pages with helpful tips, diagrams, illustrations, and pictures. 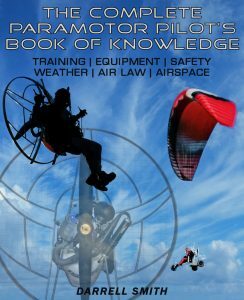 This book contains information regarding the most up to date paramotor technology, and will be kept up to date when any advances happen. An Amazon Kindle bestseller, reaching #1 in air sports & recreation! The book is in PDF format, so it will open on all computers and devices, and you can download it in seconds to get started immediately. Simply click the button below to instantly download the book. Or scroll down to read more, and to see some screenshots! Or you can download the kindle edition on Amazon HERE. But you will need to download the Amazon kindle app which you can get for free in the app store. If you're buying the kindle edition, bare in mind the Apple glitch won't allow you to download through the Amazon app, so do it through your web browser on iOS devices as explained HERE. The book has been put together with beginners in mind, but even pilots with a few hours behind them are sure to find the information very valuable. It's designed to take you through the entire training process. You'll learn secrets that you won't be told during training, and essential information that instructors are failing to teach. Many people don't have the time to study an entire book, so everything is split up into handy bite-size sections, that you can enjoy one at a time. 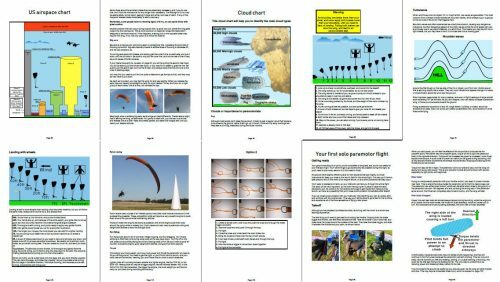 With helpful images and illustrations, and thorough explanations of everything from the theory of flight, to developing skills and confidence in the air. Throughout the book, you'll find lots of tips and tricks, and handy yellow highlighted boxes that contain important safety information. And at the end, there's a multiple choice exam (that you can also take on this site), to ensure you've absorbed all of the information. The book is designed to be read in the order that the sections appear, this lets you learn the basics first; before moving onto the more advanced stuff, like handling wing malfunctions, and emergencies. There are sections that will appeal to foot launch and cart pilots. We look at setting up foot launched, and wheeled machines. And the solo flight section deals with both foot launched, and wheeled takeoffs and landings. The rules and airspace sections are written with both US, and UK pilots in mind. And there is a small international air law section that will apply to pilots worldwide. The manual will give you a head start on your training, and it will provide a second phase of training to teach you the things instructors always miss. But I should note, the manual is not meant for self training. I recommend everybody seek professional instruction, while using this manual alongside training, and to increase your knowledge of the sport. 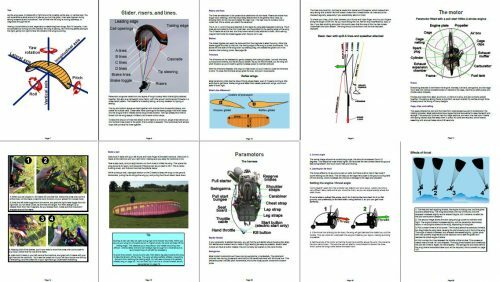 The book will be kept updated with advances in technology, so you can rest assured that you've downloaded the most up-to date paramotoring information. Do you a hard copy for sale? How do you get an updated copy? Hi Douglas, I haven’t added any updates yet. The description will be updated when an update is added.